Three soldiers were killed when NATO helicopters crossed the Afghanistan Pakistan border, Pakistani security officials said. Spokesman: "We don't think it's a very serious problem"
Islamabad, Pakistan (CNN) -- The U.S. military says only one supply route to Afghanistan has been closed by the Pakistani government after fighting that led to the deaths of three Pakistani soldiers, and a military spokesman said Thursday that United States is hopeful the situation is only temporary. Pakistan banned NATO supply convoys from entering Afghanistan after the deaths of the three soldiers, whom the government says were killed in Pakistani territory during fighting between NATO troops and militants, according to a military official from the NATO-led command in Afghanistan. Lt. Col. John Dorrian, an ISAF spokesman, said the Torkham Gate in the Khyber Agency has been closed since about midday on Thursday. Chaman Gate, the other border crossing between Pakistan and Afghanistan, remains open. "We don't think it's a very serious problem," Dorrian said. "it's a throroughfare we use a lot so it is significant. But we can work around it." "We do expect these matters to be resolved." The U.S. Embassy in Islamabad is talking with Pakistan to resolve the situation. Supply convoys are all-important for the Afghan war effort, and officials from NATO's International Security Assistance Force (ISAF) were trying to persuade Pakistan to lift the ban. Coalition forces rely heavily on convoys from Pakistan to bring in supplies and gear. Torkham Gate is one of the main ports of entry for materiel coming into the war zone. But he emphasized it's not the only way of getting supplies in, he said. Khyber Agency is one of the seven districts in Pakistan's tribal region. About half the cargo that flows into Afghanistan comes in via one of the two gates from Pakistan, the Defense Department says. Another 30 percent uses two major routes through Kazakhstan and Uzbekistan, one via Russia and the other via the Caucasus. The remaining 20 percent -- mostly sensitive items like weapons, ammunition and other critical equipment -- comes in by air. ISAF said in a statement Thursday that its forces saw what they thought were insurgents trying to fire mortars at a coalition base in the Dand Patan District of Afghanistan's Paktiya province, near the Pakistani border. An air weapons team targeted the suspected insurgents' firing position, located inside Afghanistan along the border area, and the aircraft entered Pakistani airspace briefly "as they engaged this initial target," the ISAF statement said. After this strike, the "aircraft received what the crews assessed as effective small arms fire from individuals just across the border in Pakistan" and the ISAF aircraft, operating in self-defense, entered into Pakistani airspace and killed "several armed individuals." Later, Pakistani military officials told ISAF that coalition aircraft struck its border forces. "ISAF and Pakistani forces are reviewing the operational reporting to verify the exact location of the two engagements and the facts in this case, and we will work together to fully investigate this incident. "Both sides have in mind that it is the insurgents, operating on the border between Pakistan and Afghanistan and violating the territorial sovereignty of both countries, that we are focused on fighting," the ISAF statement said. ISAF issued "sincere condolences to the Pakistani military and the families of those who were killed or injured." The Pakistani government said two helicopters from Afghanistan appeared to have crossed the border into Pakistan in the Mandata Kandaho, Ali Mangola area of the upper Kurram Agency and engaged an outpost of Frontier Corps through cannon fire. The post, manned by six soldiers, is located 200 meters inside Pakistan, and troops fired their rifles to indicate that the helicopters were crossing into Pakistani territory. Instead of heeding the warning, the choppers fired two missiles and destroyed the post, killing the three soldiers and injuring three others. "This is the third incident of its kind during past one week. In the wake of the last incident on 27 September, contact was made at the highest military level and the incident was regretted by the USA," the government said. 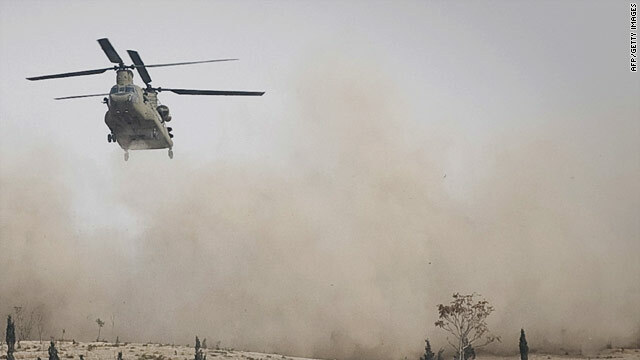 NATO helicopters crossed into Pakistani airspace from Afghanistan in pursuit of insurgents over the weekend, killing 49 people, a spokesman told CNN Monday. Crossing the border did not violate the International Security Assistance Force rules of engagement, Maj. Michael Johnson said. Pakistan is very sensitive about U.S.-led military operations on its territory and issued a strong protest Monday. Pakistan called the incursions "a clear violation and breach" of U.N. rules for foreign forces in Afghanistan. The United Nations "mandate terminates/finishes at the Afghanistan border. There are no agreed hot pursuit rules," Pakistan's Foreign Ministry said in a statement. A commander of international forces in the western part of Afghanistan said Thursday that Pakistan's recent ban on use of supply routes is "not a problem" for troops in his area of the country. Italian Gen. Claudio Berto, talking to reporters in the Pentagon via satellite from Afghanistan, said, "In my point of view, it's not a problem, we are really far away from Pakistan, and if you mean the goods for the soldier, they're coming through other borders, for example Turkmenistan. And we have no problem with this issue."